We thought it might be helpful to you to have this information before you arrive. ARRIVAL: You may arrive any time after 4:00 pm in Cottage 1 and 5:00 pm in Cottage 2. If you plan to get here late, let us know so that we can leave a light on for you. There is a sign in front of each cottage indicating the number. There is a keypad lock on the front door, and we will send you the code before you arrive. You may arrive earlier than the specified time and leave bags in the cottage, but we guarantee the cleaning will be completed by the arrival time and not before. animals that live around the pond. FLOWERS, FERNS and BERRIES: Do not pick any flowers, ferns, lichens, or moss. These plants are fragile and will live for only a short time after being picked. We have planted many of the wildflowers for everyone to enjoy. You may pick blueberries (there are lots in season in the upper field) and blackberries (around the fields). BIRDS and ANIMALS: Each year there are some different birds and animals that come to live here. We have seen otter, deer, fox, mink, fisher, muskrat, beaver, raccoon, groundhog, otter, moose, bear, osprey, eagles, several kinds of hawks and many varieties of smaller birds. TRAILS: We have built rough trails through the woods and hope you will enjoy using them. Please stay on the trail as you will kill mosses, ferns, and other plants if you walk on them. SWIMMING and FISHING: the best place to swim is from the floats or the opposite shore of the pond. 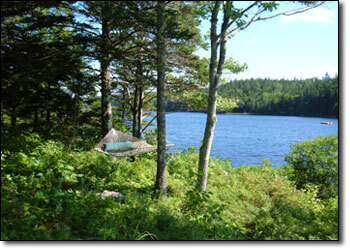 Acadia National Park owns the outlet, inlet and opposite shore and you are welcome to use any of this land. You must buy a fishing license form the Town Office in Southwest Harbor for anyone over 16 who wants to fish. BOATS: Please haul canoes and kayaks out of the water when you leave and turn them over to drain. A sudden wind can easily knock the canoe into the pond so be sure to tie the canoe to the cleat on the dock. If we have to send someone to fetch the canoe we will bill you for the time at $50.00 per hour. Please make sure there is a lifejackets for each person in the canoe and remember that lifejackets are hard to put on when a canoe is turning over. You can leave the rowboat at Cottage 1 in the water, but please pump it out when necessary. Thanks. FIRES: Please use the outdoor grill carefully. Extinguish coals and cover the grill when the charcoal has cooled. Wood in the woodshed is for your use. Do not light a fire anywhere outside. ELECTRICITY: The rate in Maine is VERY HIGH. Please turn off lights and appliances whenever you leave the cottage. SATELLITE TV and INTERNET: There is DIRECT TV in both cottages, and WiFi Internet access provided by satellite. RADIO and CD: There is a BOSE Wave Music System in each cottage, which we hope you will enjoy as much as we do. IN CASE OF EMERGENCY: There is a list of numbers to call next to the phone. DEPARTURE: We hope you have a wonderful vacation. We ask that you leave by 10:00 am Saturday so we can prepare the cottage for our next guests. Please let us know if you are leaving early or if a special situation requires that you leave later than 10:00 am. We are trying to be as green as we can, and hope you will let us know your ideas about ways in which to lighten our carbon footprint. We use paper made from 100% recycled sources for leases, correspondence, and information. Supplies such as paper towels and toilet paper made from recycled sources are in the closet near the first floor bathroom. We provide natural cleaning products including soaps by Meyer's Clean Day and Chlorox GreenWorks. We would appreciate your help in keeping the closet stocked with similar items, which you can buy at A&B Naturals in Bar Harbor. We provide garbage bags made from cornstarch or recycled plastic. We provide sandwich bags made from recycled plastic or cornstarch for food storage. There are reuseable bags in the broom closet for you to use when you go shopping. There are PVC free EVA curtain liners in showers, and most sheets are organic. We are slowly replacing those that are not. Toys in the sandboz are made from recycled milk jugs and contain no BPA or phthalates. Trash is picked up on Thursday mornings in the spring, and on Saturdays in the summer, and recyclables on the last Friday of each month from the galvanized cans near the garbage house., You MUST put trash in black plastic liners, which we have provided. Please do not leave recyclables in the cottage. We do not have a place to compost at this time, but may try to provide one again next year. The hot water heater is set to 120 degrees. Wood for woodstoves is primarily from our property. We use native plants when landscaping and only organic pesticides (and rarely) as well as organic fertilizers. Please keep noise to a minimum. For instance, use headphones if you want to play music while outside the cottage, and keep the volume on the TV and radios down. Your neighbors will appreciate this, as will the birds and animals that live nearby.